Disney's little blue alien who starred in Lilo & Stitch gets his own Nintendo DS adventure. In Stitch Jam you play as Stitch, who sets out on a musical adventure to save his girlfriend Angel, who has been kidnapped by Dr. Hamsterviel. It seems that Angel's powerful voice can be used for his evil plans, so your job as Stitch is to complete the 10 rhythm-based missions and get your girlfriend back. Although you don't control Stitch directly, the game does a very good job at staying simple, but gradually increasing difficulty in the movement and rhythm patterns. As Stitch parades through the side-scrolling sceneries, you must tap the screen with the stylus as he reaches certain icons, always in time with the music. Other icons will turn into arrows that require you to slide the stylus up or down, making him dodge or attack enemies. Alternatively, you can use A or B as you pass through the notes, and Up/Down on the D-pad as you reach the arrow icons. As you hit the notes at the right time, the music keeps on playing normally, but if you miss, there will be periods of near silence. You don't necessarily have to tap the icon, it works if you do it anywhere on the screen, but you still get graded according to your timing. Hitting several notes in a row raises your combo meter, while failing too much will make the game end (you will notice the screen flash yellow and eventually red as you are about to fail the stage). 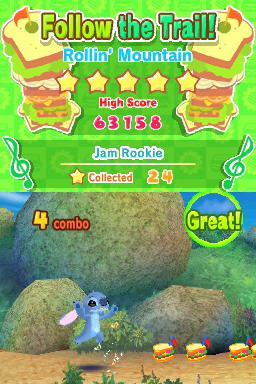 Due to the nature of the game, your focus will be mostly limited to the "notes" and the music, which makes it easy to miss the cute animations that go on in the background as Stitch walks on. 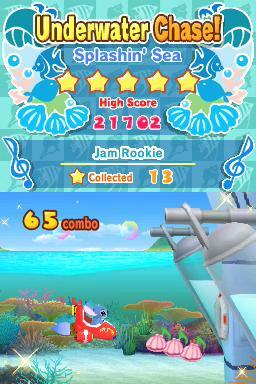 Stitch Jam is a fairly short game. The 10 missions should take about an hour, maybe two to complete. Of course, since the game is aimed at the little ones, this will obviously last longer for them. But there is still some replay value to be found. 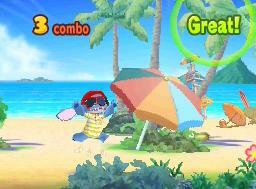 A co-op mode is available via Download Play, and doesn't require a second game cartridge, so two friends can play as Stitch and Angel on the same adventure. After completing the main story mode, you can revisit all stages with new characters and unlock some funny extra costumes for them. You also unlock D-Gamer avatar items and honors (something like achievements) as you progress through the adventure, revisit stages and get better scores. No clue what D-Gamer is? D-Gamer is Disney's online community which you can access via the Nintendo DS Wi-Fi. You must first register on the official site to create an account, which you then use to log on though your DS. D-Gamer lets you customize an avatar, male or female, with plenty of options, and share your hard-earned honors with other users. On the technical side, having the option to choose between stylus and button controls is a plus, since sometimes I felt like the drag motions weren't recognized properly. I actually enjoyed the look of the game quite a bit. The backgrounds are cute and have little details that are worth looking at (even at the cost of a missed note or two), from bright sandy beaches to the darker depths of a mine and the vast starry space. I also really liked some of the music, which had me shaking my foot in rhythm to the tunes. 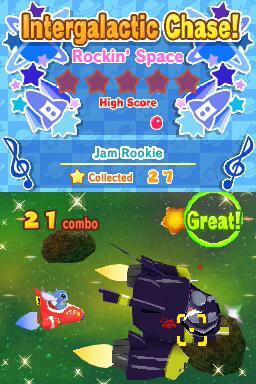 I know I'm way past the target age for this game, so I was surprised to have enjoyed Stitch Jam this much. 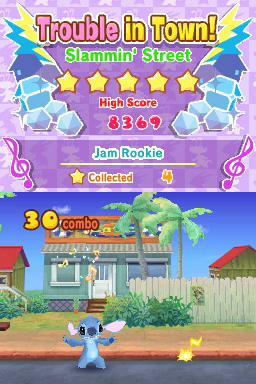 It turned out to be a fun and cute rhythm game that anyone can enjoy.